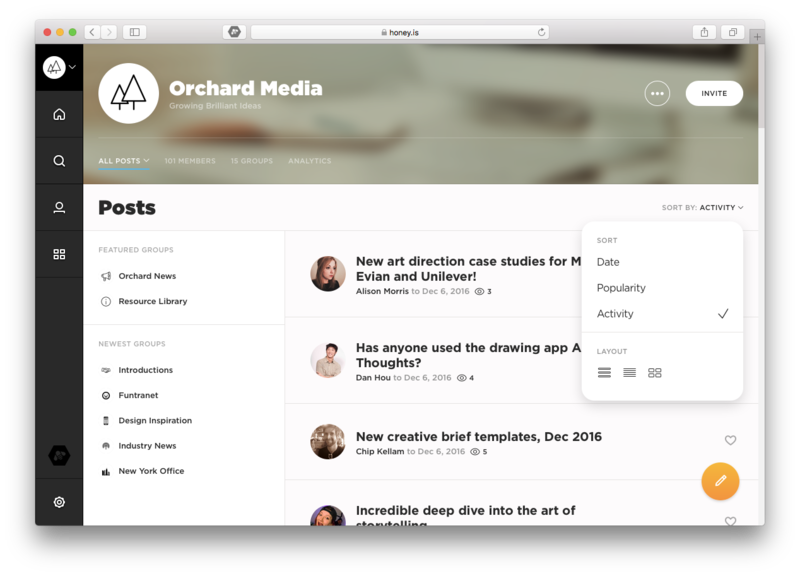 How to customize and manage your Honey feeds. Your Honey feeds are where all of the action happens. All the posts in Honey are display through a number of feeds throughout the platform. Let's dive into how they work. Learning more about your Honey feeds. In this section, you'll see a complete list of the three type of feeds. Your Feed. Your feed displays posts from all the groups you're a member of. It's the easiest way to keep up with a curated list of information that's important to you. You can access your Feed by clicking the house icon in your left hand navigation menu. Organization feed. Your organization feed—titled as the name of your organization in your left-hand navigation bar—displays posts from all the groups in your organization, both from the groups you're a member of and from the groups that you are not. Group feed. If you'd like to drill down into the posts in a specific group, use the group feeds. Group feeds display all the posts in a specific group. To view a group feed, visit your groups page and click through to view a specific group. Customizing how your feeds display content. Locate the Sort By dropdown menu in the top, righthand header of your feed. Click your prefered sort and layout option. Your feed will automatically change. Learning more about our sort and display options. Date. Your feed will sort by publish date with the most recent on top. Popularity. Your feed will sort by most popular posts within your organization. Our popularity algorithm takes views, likes, comments, and recency into account. Activity. Your feed will sort by posts that were last published, edited, or commented on with the most recent on top. Compact display. Your feed will display with smaller text for each post. Normal display. Your feed will display with comfortably sized text and post details. Visual display. Your feed will display in an image-centric view with previews of images or documents on display. When viewing the feed, some posts will have small blue circles in the lefthand margin and some will not. The blue circles indicate the posts that you have not read and the posts without indicate the posts that have been read. When you return to your feed the blue marker will disappear from your feed once you have read the post.